Another college basketball season is in the books after top-seeded Virginia downed Texas Tech in an overtime thriller for the national championship on Monday night, 85-77. 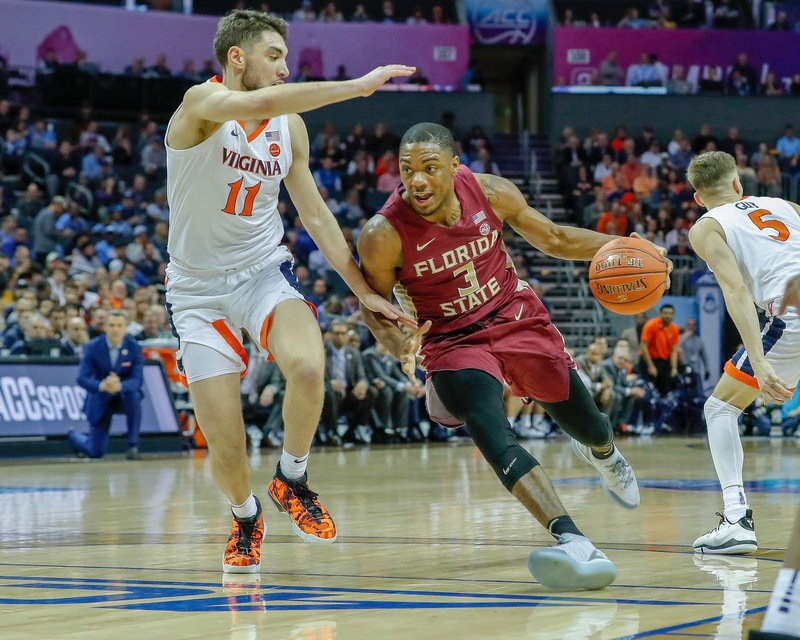 As most Florida State fans are well aware, the Seminoles were the last team to knock off the Cavaliers when the teams met in the ACC Tournament semifinals. 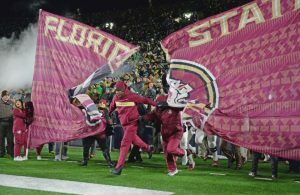 It would be the third time in program history that FSU would go on to beat the eventual national champions. Hosting defending national champion Florida to open the month of December 2006, Florida State was not intimidated by its rivals laden with NBA talent like Al Horford, Joakim Noah and Corey Brewer. In a hard-fought contest, it would be a future NBA lottery pick that stole the show, but not one wearing orange and blue. Al Thornton finished the night with 28 points and nine rebounds — both game-highs — while shooting 10-for-16 from the field to pace the Seminoles. FSU led by as many as 14 in the second half before the Gators cut the lead to two in the waning seconds. With time ticking away, FSU’s Toney Douglas blocked Taurean Green’s potential winning 3-point attempt. Thornton was able to corral the miss and knock down a pair of free throws to cement the victory. Isaiah Swann added 11 points for Florida State in the win. Green led the Gators with 21 points and five assists. Florida would go on to beat Ohio State to win a second straight national title. Florida State had never beat the No. 1 seed in the ACC Tournament before it met North Carolina in the 2009 ACC Semifinals. The Tar Heels were without star guard Ty Lawson, who had knocked down the game-winner to beat FSU during the regular season, but with Wayne Ellington, Danny Green and reigning Naismith Award winner Tyler Hansbrough in the lineup, they weren’t short on NBA talent. North Carolina led by as many as eight in the first half, but FSU was able to pull within three at the break before leading for most of the second half. After Bobby Frasor split a pair of free throws to give North Carolina a 70-69 lead with over a minute to play. 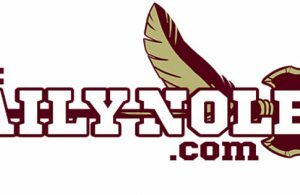 The Seminoles went ahead for good on a pair of free throws by Toney Douglas with 48 seconds left before felliow FSU guard Derwin Kitchen stripped Hansbrough on the other end and made two more foul shots. Ellington and Green both missed tying 3s on the final possession for the Tar Heels. Douglas finished the day with 27 points on 10-for-18 shooting. Kitchen finished with 11 points, nine rebounds and six assists in the win. Ellington scored 24 points to lead North Carolina and made all four of the Tar Heels’ 3-pointers. It would serve as the final loss for North Carolina before going on to top Michigan State for a second national championship in four years. 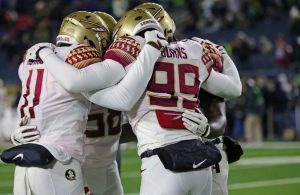 In circumstances similar to a decade prior, Florida State entered the ACC Semifinals as a No. 4 seed against top-seeded Virginia. The Seminoles raced to a 20-10 lead and held a 35-31 advantage at the break. The Cavaliers were able to pull in front on a jumper from Kihei Clark with more than 13 minutes to play. FSU then pulled back in front with five straight points from Mfiondu Kabengele before a 3-pointer from Ty Jerome cut the Florida State lead to one. From there, the Seminoles responded with a 13-1 run to seize control of the contest. David Nichols finished with a game-high 14 points on 6-for-8 shooting to lead four FSU players in double figures. De’Andre Hunter led the Cavaliers with 13 points. Virginia topped Texas Tech on Monday night for its first-ever title.